To me, pesto is one of the most magnificent scents to come out of the kitchen. Basil’s crisp, fresh aroma is undeniably delicious on its own, but combine the delicate leaves with Parmigiano Reggiano, a stellar extra virgin olive oil, lightly toasted pine nuts, and just one strong clove of garlic, and the wide-eyed inhales and appreciative moans begin. 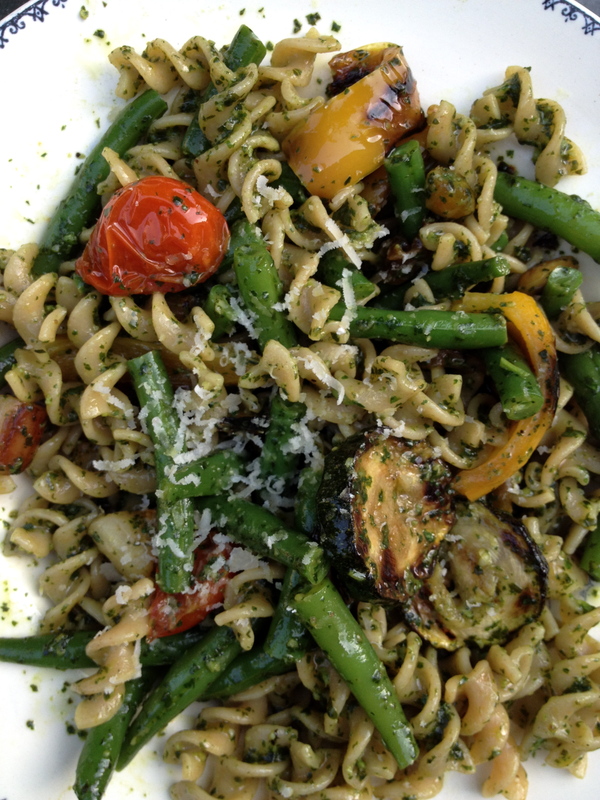 Now the challenge becomes: how can I make this pesto pasta dish different from the last one? I find that vegetables add even more juice, flavor, texture, and interest to the dish. Fusilli is the perfect size for all ingredients involved: one forkful guarantees all of the major players, and bonus that the pesto sauce gets tucked and interlaced into the crevices. The twist here is the bay scallops, which actually were made the night before as a stand alone item. For this dish, I added the leftovers to the pot and voila: seafood, colorful summer vegetables, and satisfying whole wheat pasta all on one plate. Recipe: Make the pesto and set aside. Bring a large pot of water to a boil. In the meantime, heat a grill pan or an outdoor grill. Slice the zucchini crosswise into 1/4 inch rounds. Cut the yellow pepper into strips. Drizzle the grill pan with olive oil. Add the vegetables to the pan and cook for about 8 minutes on each side. Rinse the bay scallops and season them with a pinch of salt and pepper. Add the bay scallops to one section of the grill pan. Add the halved cherry tomatoes to the grill pan. Steam the haricot verts (about 6-8 minutes over a medium-high flame). Add the pasta to the pot. Save a few ladlefuls of the starchy pasta water. Once al dente, drain the pasta and immediately add it back to the pot over a low flame. Drizzle it with olive oil to keep from sticking. Add the grilled vegetables and the steamed haricot verts. Add the pesto. Gently mix to combine. If necessary, add the pasta water by spoonful to make the pasta more moist. Serve immediately with grated Parmigiano Reggiano.